Adam Riess, co-discoverer of the accelerating expansion of the Universe due to dark energy, visited Harvard last year, where he told me a story about his time in grad school there. He recalled hearing a lecture on the uncertainty in the rate at which the Universe is expanding and thinking, “That problem will never be solved.” Twenty years on, we know the local expansion rate (called the Hubble constant, or H0) to about 4% precision, and many different, independent techniques find mutually consistent values. However, measuring the Hubble constant remains one of the most important problems in cosmology because it is intimately connected to the Universe’s contents. In particular, General Relativity means that the Universe’s contents set its expansion rate, and so precise measurement of the expansion rate can probe the amount and evolution of different components of the Universe. Thus, it is exciting when a new, independent method of measuring the expansion rate (H0) is proposed—and even more exciting when it works. In the short paper I discuss today, the authors show that time delays in the light emitted from distant, violently variable galactic centers (“active galactic nuclei”, or AGN) can probe H0 with precision similar to that of the Hubble Space Telescope—and out to about twice the distance. The physics behind this technique is beautifully simple. An active galactic nucleus is a volatile, violent, hot center of a galaxy (our own galaxy does not have one! ), and it destroys all material around it out to some radius. Thus, the dust around it is hollowed out into a torus (donut-shape). The dust in the torus absorbs light from the nucleus (UV) and re-emits it in a different wavelength (near infrared) and at a time delay from when the nucleus emitted it. So, if the nucleus varies on some timescale, the dust emission from the torus will too, but with an offset due to the distance from the nucleus to the torus. The delay is simply due to the time light takes to travel from the nucleus to the torus. Geometry for the AGN reverberation distance method. 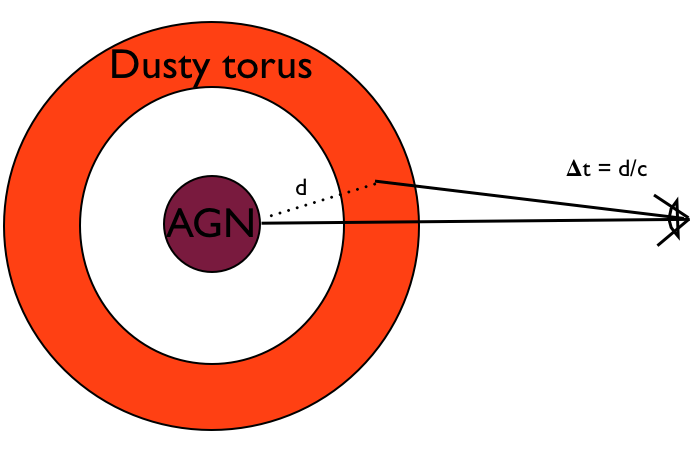 The active galactic nucleus (AGN) clears dust out near it, creating a torus of dust around it. This torus re-emits light it absorbs from the AGN at a time delay given by the distance d to the torus over the speed of light c.
Now, the distance to the torus (d in the diagram above) is known to scale very simply with L1/2, L being the intrinsic luminosity of the nucleus. So the time delay, which can be measured by comparing the dust emission to the nucleus’s emission, tells us the luminosity. We can also, independently, measure the flux we receive from the nucleus,which depends on both the distance from us to the AGN and the luminosity of the AGN. If the latter is known, we can infer the distance from us to the AGN. The authors apply this simple method to use 17 galaxies to measure the expansion rate of the Universe (H0) and find good agreement with other current measurements, and reasonably comparable error bars. The beauty of this method, however, is that it can enable measurements of the expansion rate out to much larger distances from us than many other current methods, which in turn opens up a new regime for placing constraints on the contents of our Universe. In particular, the method can be used on high redshift quasars (these objects have been found at redshifts as high as z~7), whereas the Hubble Key project results below come from Cepheid variable stars, which are too faint to be detected at cosmological distances. Supernovae are another way of measuring cosmic distances (and have been applied out to higher distances (~10 Gpc) than this paper goes), but there simply are not very many at high redshift, in contrast to quasars, meaning the AGN method potentially can complement supernovae distance measurements well. This shows the expansion rate measurements of this method (red) compared with the Hubble Space Telescope Key project (green). The plot has recession velocity (speed something is moving away from us) on the vertical axis and distance on the horizontal axis. Note that both green and red points are well-fit by a straight line, meaning they are consistent with each other, and that both have similar error bars. 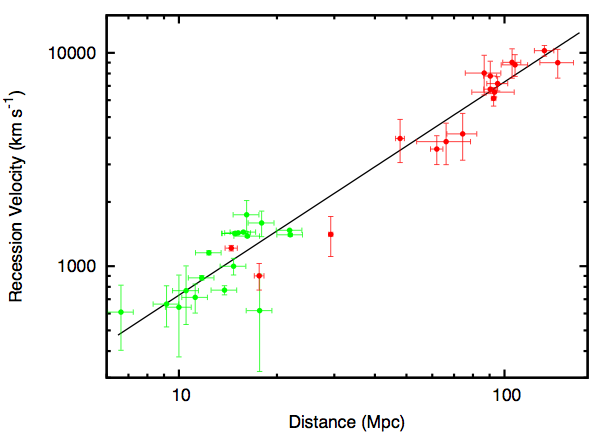 But, the red points (from the AGN method) are at about three times the distance of the green points (100 Mpc vs. 30 Mpc).